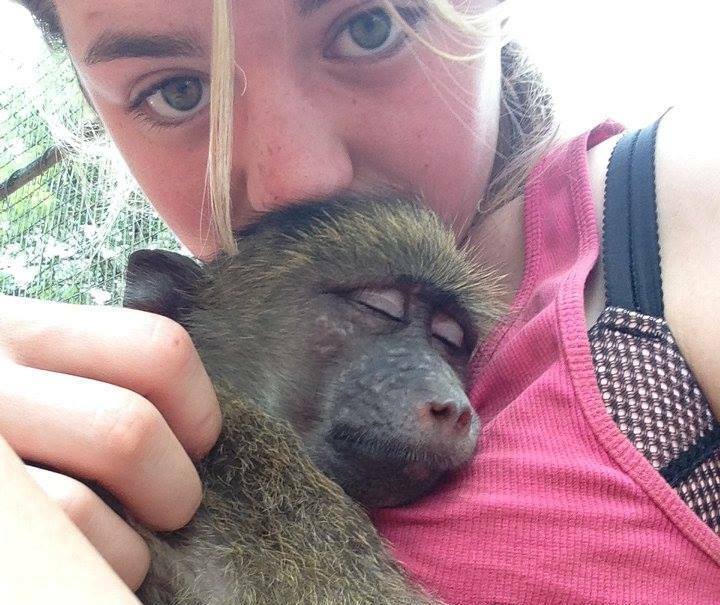 If you read nothing before you sign up to volunteer with monkeys in South Africa, read this amazing blog from Rebecca Dean, a returned volunteer with monkeys and baboons. Thanks Rebecca! You’ll start the morning early (yes those dreaded words) but it’s so amazing to wake up to the sounds of the baboons who are in an enclosure right by the volunteer dorms. You can indulge yourself in a morning chat and a quick tea or coffee before you get to work. 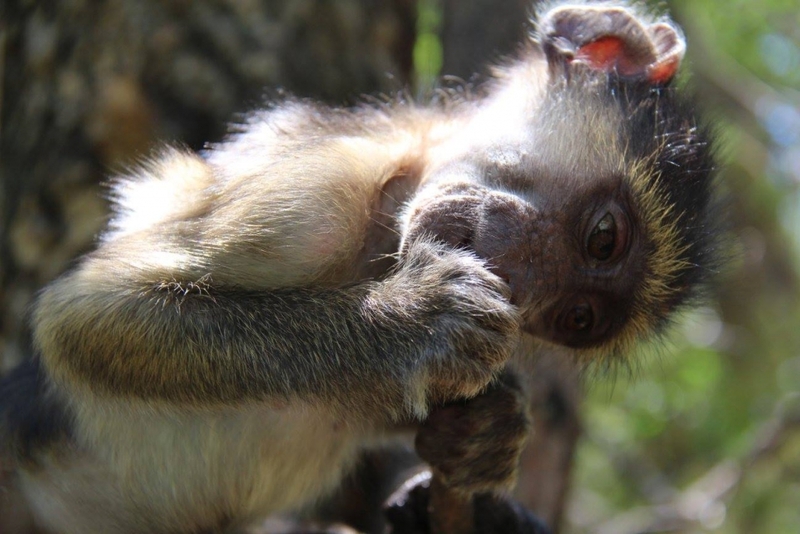 If you can call it that – who would call feeding a baby baboon with a bottle of milk work?? I would happily be up at any time of the day for that. Afterwards you will have to put in a little bit of effort as its either time to clean the cages or prepare the food. And yes, if there is no shortage of the fresh fruit and veggies then the owners have no problem with you having some bananas, papayas, oranges, or even cabbage! Trust me, you will never have had fruit quite as good as there. After breakfast it’s time for a general tidy up of the area, even some harvesting to collect wild plants so that the monkeys can start to learn what they can forage for in the wild. This is also time to finish off any chores that need doing, and again the babies will need feeding once more! After lunch it tends to be more of a chill out time, depending on what projects are going on. This is the time when the volunteers are asked to monitor certain monkeys or baboons, or they take the baboons down to the pool to run around and climb. Don’t be afraid to jump in the pool, the baboons love a good swim and your clothes will probably be dirty anyway. From 16.00 your time is your own, you can take a shower (you should take a shower), use the wifi, read a book or play cards with other volunteers. Alternatively if you haven’t had enough of the monkeys you can go and chill in the cage with them for a bit longer. Just make sure you have clean clothes for dinner! I need a new paragraph for dinner because Lynne does fantastically with that one. All sorts of foods are provided. Breakfast and lunch are similar every day, but dinner is something new all the time. Saturday night is braai night which is a South African barbecue (although they’ll kill me for calling it a barbecue) which is great if you like meat – they do also provide veggie options. You may be on baby duty, which means you’ll need to do the evening feed for the babies and bring their boxes down to your dorms at night! The volunteers tend to play cards and have a couple of drinks, it’s all very social. Generally everyone is in bed by 10, ready to wake up early again the next day. Don’t take any clothes that you care about, they will get dirty. And the washing is good, but it is still South Africa so items of clothing may get a little damaged. Take an old towel that you don’t care about (or a couple). You can donate them to the baboons once you’re done there and you have space in your bags for souvenirs. Take as much money as you can (best on a travel card, and maybe a spare card). It’s a one in a lifetime opportunity and you don’t wanna miss out on the trips like Kruger. Enjoy every moment and don’t skip out on any opportunities that you have. Dear Gillian me and my daughter are also there in July when do You Start?